We’re putting our own skeleton in now and we are going to start at the root of the skeleton’s hierarchy. Where should we place our first bone? 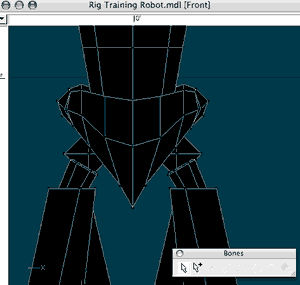 We’re still looking at our robot model in Bones Mode. Now we are going to add our first bone! We’ll start in the [Front] view because with this particular model it’s easier to get a bearing on the layout in this view. We are going to start by placing the bone that will become the root of all of the other geometry bones. But which bone should that be and where should we put it? This is a very good question and the answer may vary from model to model. In this case, our root bone will be the topmost parent of all of our geometry bones. That way, when it is moved in an Action or Choreography window, that the rest of the model will follow along in a logical and controlled manner. 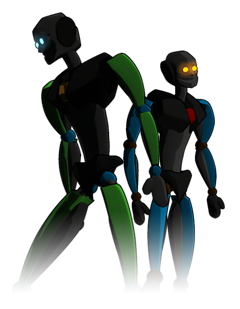 For a humanoid model, like this, the best area to focus on would be the torso… because the legs, arm, and head all branch out from the there. But where in the torso should we place it? We’ve zoomed in on the hips so that we can place our root bone there. The best place for us to start is at the hips. If you map it out in your mind, you can see that everything else branches out from the hips. The hip’s placement and orientation greatly influence the rest of the body’s disposition. The legs branch off from the hips. The spine branches off from the hips and from the upper spine region the head and arms branch off. If you play or have played at any level football or basketball etc , you can always reliably track the movements of the player that has the ball by just watching their hips. The player goes nowhere without their hips guiding them there first. It does not matter what they do with the ball or their arms and legs, if you watch the hips (in real life not on TV) then you won’t be misdirected often by fancy footwork. I you watch closely the next time you are at a sporting event, what I am saying to you may become clear to you. Place your first bone and orient it like this. Let’s zoom in on the hips so that can place our bone there. Go ahead and create your first bone and orient it like you see it in the image on the left. 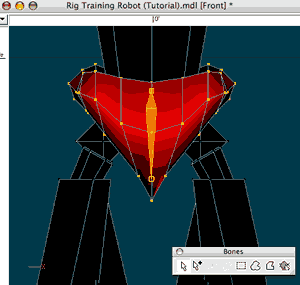 Make sure that you center it along the model’s X axis as you see here. When you finish that, switch to your [Left] or [Right] view and center your bone within the hip’s mass. Once the bone is positioned to our satisfaction we need to assign the CPs that we want to be controlled by the bone to the actual bone. We’ve assign one CP to the bone here and the area changes to the color of the bone that controls it. 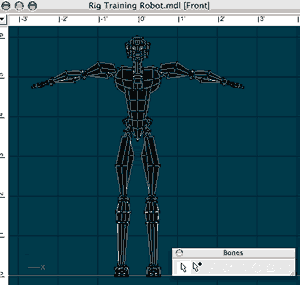 In this model, the hips are not connected to the rest of the model’s mesh so this will make things a little easier for us to do than if this model were a single whole mesh. In order to assign CPs to a bone we need to select the bone that we want to assign the CPs to. Once we do that the bone will start to flash. Now, select the bone that we just added now. At this point we can start to assign the CPs. I’m going to do it the easy way in this example. 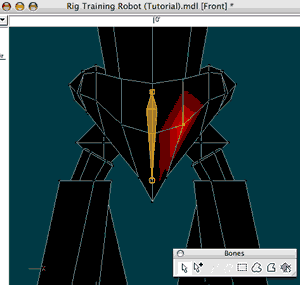 While the bone is selected, Shift-Click one of the CPs on the hip portion of the mesh. You can see what happens here on the image on the left: The CP that I Shift-Clicked is now red and the immediate area surrounding that CP is red as well. Hips are now completly controlled by the bone. 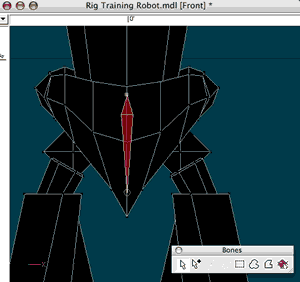 Since the hips are separate from the rest of the mesh, using the “Group Connected” command helps make things easier. This indicates that the CP is now controlled by the bone. We need the rest of the hip mesh to be controlled by this bone too so while the bone is still selected, choose the “Group Connected” option from the “Edit” menu or use the keyboard shortcut which is the forward slash “/”. Now you can see that the entire hip is now controlled by the bone. To be sure go ahead and rotate your view of the hips to see that all of its CPs are associated with the bone..
Did you accidentally assign the wrong part of the mesh to the bone? If you did it’s easy to get back on track. Make the Default Bone active. While the default bone is flashing, select the CP(s) that you did not mean to assign to the hip bone and they will once again be assigned to the Default Bone. It is a very good idea to give descriptive names to each bone in your rig. It is a very good idea to get in the habit of using descriptive names on all of your bones in the PWS. If you have not done so already go ahead and do it now. You can name the bone whatever you like, as long as you don’t give it the same name as another bone in the same model (A:M will let you know if you try it and tell you to use another name). I like to know exactly what the function of the bone is that I am looking a in the PWS without having to look in the Modeling window to figure it out. This is a good thing to do, especially when you start using constraints and have to troubleshoot your rig’s setup. With that in mind I will name this bone “(GEO) Hips” . 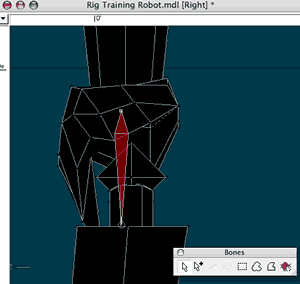 This tells me that this bone controls the model’s geometry (mesh) and that it is the hips area. You don’t have to name it like I have. Use whatever naming scheme that you are comfortable with and try to be consistent about it. This is much easier than you thought right? We’re not finished yet but If you understood just that one sequence then you’re in great shape for the rest of this section.